People often ask me how to get started online. I always say the same thing: Build your own website and immediately publish valuable content. And, you know what’s amazing? You can do that – I mean all of that – in just 5 minutes and for less than $4 a month. 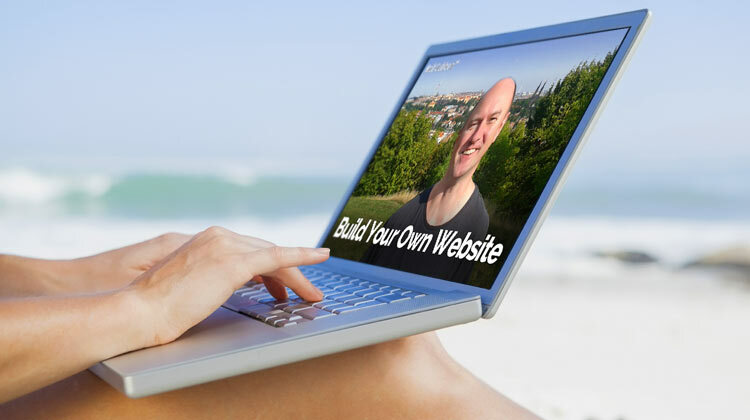 build your own website and go live! I’ll show you how to get up and running so that you can do the following: Create great content, attract followers and customers, and make money. What will my website / business be about? I started out in business doing graphic design jobs for clients. This wasn’t work I really liked. But I loved the business. So it became a passion project as I pivoted into web design and product creation. So don’t get too hung up on niche or market selection. You could brand your website, as I have done, with your name. This means you don’t have to stick to a niche so much. If you want to leave your job and work online you may find it easier to pick up freelance work. This is the easiest way to make money on the side. And you can build it up while you’re still employed. It’s totally safe! And, remember, now is the time to do it. Never, in the course of human history, has it been so easy to start working for yourself and build your own empire. The domain name is the home of your website. It’s the something in the www something dot com. A domain name ends in an extension like .com, .net, .org. and many more. However, the extension I like remains .com. Think all the good .coms are all gone? Think again! Have a look at this video where I show you how to get a fantastic .com with LeanDomainSearch.com. Keep your name short and sweet. A shorter name is easy to remember and find. Make sure your domain name is easy to say and to spell. People don,t want to stop and think about how to say or spell your domain. Use keywords? Keywords are the searchable terms for your business. So, for example if you’re a web designer, you may consider putting “web designer” in your domain name. If you place keywords in your domain name it may give your business a slight boost in the search engines when people search for those keywords. Be creative but don,t overthink your domain name. Don’t let this decision stop you from taking action. Remember, you can change your domain even after securing traffic and authority. You can redirect from one site name to another. You can register your domain name at a domain name registrar such as GoDaddy or Namecheap. Or you can register a domain at a web host such as Hostgator. The links to web hosts and domain name registrars in this article are affiliate links. This means I will be paid a commission if you purchase a service through them. If you don’t want me to receive the commission then you can just google the name, like Hostgator, for example. It doesn’t really matter if you register your domain name with a domain name registrar or with a host. However, if you register your domain name away from your host, you need to change the nameservers to point to your host. You can see how to do this in the video below. The webhost I’m using for this example is Hostgator. Why? I have been using them for years. I still use them now. And I’ve found them to be generally a reliable and competent host with good support. Are they perfect? No. But you’ll be hard pressed to find anyone who’s had zero problems with a webhost. It’s not an easy service to run. There are issues with security, updates, email blacklisting, site speeds, cache, software versions, conflicts, etc. The list of things that can go wrong with websites is truly endless. So if you choose an established, large company it will have the resources at its disposal to help you if you need it. That’s why I’ve gone with Hostgator in this example. They are a good choice if you’re just starting out but they also have more advanced plans for when your business scales. Now that you have a website, a domain name, and a hosting service it is time to publish your website. You can do all that by setting up WordPress on Hostgator with an easy one-click install. The above video shows you how you can easily build your own website in minutes by setting up WordPress on cPanel at a host. WordPress is free, open source software that powers 20-25% of the world’s websites. You can use it to set up a one page website as well as an incredibly complex, busy website with thousands of pages and a shop. Sure, you could use Squarespace, Wix or some other easy build solution. They may be more user-friendly at first but these services will not be able to scale the website in the way that WordPress can. WordPress can be set up in seconds and will provide you with a content management system that will be able to handle anything you can throw at it. Its competitors can’t do that. That’s why I use WordPress. Sure, WordPress has a learning curve to it. (Well, that’s what people tell me, personally I think it’s quite easy). But that’s really no excuse. It is very easy to build your own website, create content and set up a business that will support the lifestyle you want into the future. And you can start now! The most important first step you can make in business these days is to create useful content. You can do that now. As soon as you set up WordPress you can start creating content. Do it now! I like that you encourage business owners to take their futures into their own hands. While a professional webmaster may be faster and trip over fewer pitfalls, the business owner knows the target market intimately and is better positioned to develop pertinent site content. In my experience, it is NOT 5 minutes (nor 5 hours, nor 5 days), but well worth the learning curve to develop and nurture a web experience reflecting the concerns of your specific client profile. I completely agree, Jim, it’s very good to develop and grow a web presence and really put a lot of time into it on an ongoing basis. Glad you’re enjoying my content. Thank you so much.